HIGH RISK If parts of Sonoma County are now deemed high risk for wildfires, how will that change insurance rates? As the historic North Bay fires are brought under control, data coming out of the state insurance industry tell a tale of massive destruction: nearly 5,500 residential losses, 601 commercial losses, up to 3,500 noncommercial auto losses and 39 boats burned up in the blazes that killed 43 and caused more than $3 billion in damage. But there's one fire-related statistic that's interesting for its small size: 23. That represents the number of people who have so far filed insurance claims through the California Fair Plan, the fire insurer of last resort for those who can't get otherwise get a policy because they live in an area at high risk for wildfires. 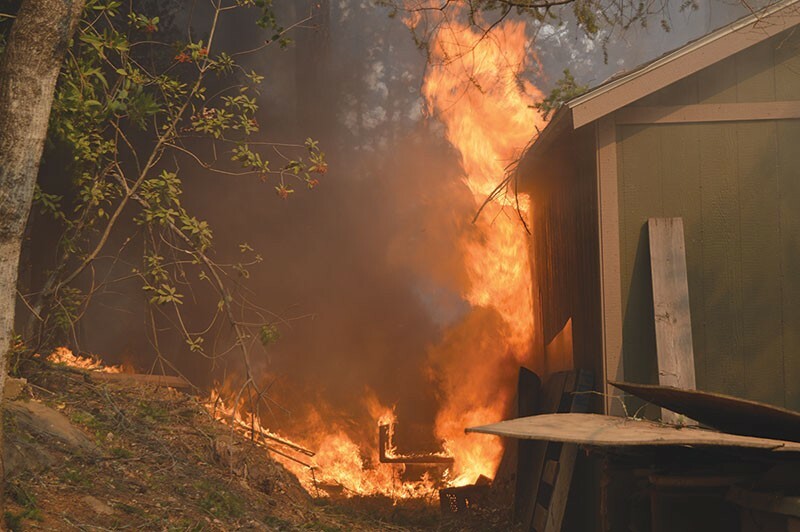 As it now appears that high-density parts of Santa Rosa are at high risk for wildfires, what will that mean for the California Fair Plan moving forward and for homeowners' insurance policies in places like devastated Coffey Park? Will those folks still be able to access the private homeowners' insurance market? Will the California Fair Plan see a spike in participation as the state insurance industry also grapples with a "new normal" of potentially non-anomalous urban wildfires? In places like Coffey Park, "we did not have much in the way of market share," says Anneliese Jivan, president of the California Fair Plan. "Those neighborhoods were not considered high risk brush or wildfire areas, so we weren't writing there." Does she think her agency will be writing policies in the neighborhood as it is rebuilt and which lost some 1,400 homes to the inferno? "What I can tell you is that I can't predict what is going to happen, but we will be there for whoever needs us," Jivan says. "If the insurance industry, en masse—and I don't think this will happen—says, 'We won't write it,' we are going to be there, regardless of the number." Created in the aftermath of the 1968 Watts Riots, the California Fair Plan is based in Los Angeles and was established by the California Legislature in response to inner-city businesses' inability to secure insurance after those riots. It soon expanded to include insurance options for people in areas at high risk for wildfires, and 50 years after its inception, may be more critical than ever. The Fair Plan is essentially a privately run high-risk insurance pool that's audited every three years by the state. It writes policies that are collectively underwritten by all insurance companies that do business in California. That same insurance industry has been running away from fire policies almost as fast as Coffey Park residents ran from their blazing homes—a phenomenon highlighted in fallout from the 2015 Valley fire in Lake County, says a consumer advocate. "Before this catastrophe, our organization had been involved with people in certain parts of the state who've been dropped or had their rates go up a lot," says Amy Bach, executive director of United Policyholders, a consumer-advocacy group based in San Francisco. "We've been worrying about this and the [State] Department of Insurance has been worrying," adds Bach. "Things were a little scary before this—meaning insurers were starting to get the heebee-jeebies about staying in the fire-insurance market in California, and you can't blame them, right?" Homeowners insurance is not mandated by the state but is a requirement for anyone who wants to get a home mortgage from a bank. The California Fair plan won't deny anyone in a once or future high-risk area, says Jivan. In the aftermath of the devastating Valley fire, access to the California Fair Plan was tweaked to ease access for consumers now faced with an industry in retreat from writing fire policies. "We went to the [state] insurance commissioner," says Jivan, "and said, 'Look, we're making it hard to let people come in, because three companies would have to have denied them coverage.' We just made it easier to come to us if they need us." The coverage offered by Fair Plan isn't as comprehensive as one would find in the private market, says Bach. "The coverage is basic," she says, while also crediting the state for creating the program and expanding it. The insurance offers two separate tiers of coverage, one more comprehensive than the other. "I give props to Insurance Commissioner [Dave] Jones and his team. They've tried to expand the benefits that are available with a Fair policy, but after past disasters, we've seen that many people were grossly underinsured." "Generally speaking," says Bach, "you don't want to be in the Fair Plan unless you don't have a choice." The California Fair Plan covers up to $1.5 million in losses at a single residential location, according to online resources. Bach expects that in places like Coffey Park, homeowners will likely experience an increase in their insurance rates, regardless of any new official high-risk designation that may come from state fire officials or insurance actuarians. Before the fire, says Bach, "their home insurance was probably quite affordable, relatively speaking, and people were paying between $800 and $1,200 a year for their home insurance. I think we are going to see some changes in the market. The days of people paying under $1,000 for fire insurance in California I think are numbered. That is certainly where insurance companies have been saying they are headed." As the fires raged, the industry tuned in to the new normal of urban wildfires and their implication for insurers. A report in the online Insurance Journal that appeared while first responders were still plunging into the variously horrible infernos that broke out across three counties on Oct. 8, reported that a hazard-risk analysis undertaken by the Irvine-based analytics firm CoreLogic, found that 172,117 homes "with a combined reconstruction cost value of more than $65 billion are at some level of risk from the wildfires in the Napa and Santa Rosa metropolitan areas alone." That's a lot of newly identified risk—but consumer advocates say the insurance industry can absorb it. "As big as the fire was," says Bach, "it's still a drop in the bucket in terms of the number of policies that they have in force in the state. They should be fine, and these fires shouldn't prevent them from doing business in the state. We'll see some reduced competition, some reduced availability and some increased pricing," she adds. Mark Sektan, president of the Association of California Insurance Companies, a Sacramento-based lobby for the insurance industry, says time will reveal how fire insurance plays out in places like Coffey Park. "At this point, it's too early to really anticipate what companies may or may not do in the aftermath of the North Bay firestorm," Sektan says. "I would anticipate there would still be availability," he says, noting that some insurers may leave the fire-insurance market while others may choose to take on more risk. In the meantime, insurance agents have deployed throughout the region and have already started cutting expense checks for people who will be displaced for many months as their homes are rebuilt. A 2003 reform to the state insurance code now requires that insurers provide up to two years' worth of expenses to the displaced; other state laws forbid insurance companies from dropping customers for a year after a disaster is declared. That reform was of great help to Lake County fire victims, says Setkan, who notes that one lesson in these cataclysmic fires is that "the cleanup takes forever. Nothing can happen until that happens, and the cleanup is not driven by the insurance industry." Consumers are also protected by insurance reforms implemented by Proposition 103 in 1988 that prevents the industry from engaging in price gouging, says Nancy Kincaid, chief spokesperson with the State Department of Insurance. "[Proposition] 103 mandates that rates are fair and justified," she says. When the industry models losses in a rare "anomaly" event such as the North Bay fires, and scopes out the losses over a two or three year period, she says, the industry can't justify a spike in insurance rates to address anticipated losses—they can raise it "maybe 5 percent." But how does this storyline change if what was once rendered a rare anomaly by the insurance industry is now the norm? Jivan says fire-modeling methods that created the "previously defined high [risk for] brush-fire areas won't work anymore. It is my opinion that this will be a big wake-up call."